Image Size: 18"w x 23 1/2"h.
The original works of Z.S. Liang are quickly becoming unattainable. Offerings of his new paintings are, more often than not, handled by draw or silent bid. At the 2011 Masters of the American West at the Autry National Center, collectors never even had the chance to bid on his silent-auction entry. That painting won the Purchase Award, so the museum had already secured it for their collection. The work of this great artist is in high demand, and that demand is only going to grow. No other Western artist is tracking in the market like Liang. And while the originals are hard to come by, his work is attainable in Fine Art Editions from The Greenwich Workshop. 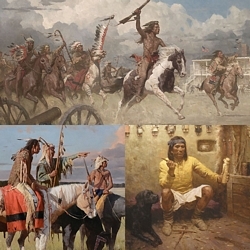 It is paintings such as Lakota Warriors, Little Big Horn, June 25, 1876 that have collectors taking notice. Power and strength of composition and a master’s brushwork combine with a storyteller’s passion for the untold experiences of Native Americans. “During late 1875 and early 1876,” begins Liang, “young warriors were slipping away from their agencies to join bands of non-treaty Indians in the country east of the Bighorn River. American government authorities, in response to reports of this, ordered all Lakota bands to return to their reservation by February 1, or face the consequences. Sitting Bull, Crazy Horse and the other leaders not only ignored the order, they were determined to fight for their freedom.